Robbie Mather is a Partner and jointly heads the Commercial Property Department. 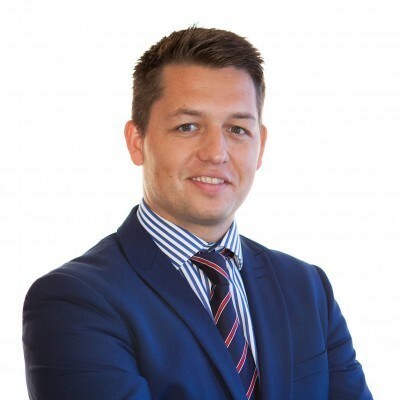 He graduated in Law and Accountancy from the University of Manchester, Robbie qualified as a solicitor in September 2010, having begun his training contract with Burnetts in 2008. As a former work experience student, his association with Burnetts goes back over a decade. Robbie advises clients on the sale, acquisition, lease and charging of land and property. He has advised some of Cumbria’s biggest businesses and house-builders, playing a key role in multi-million pound land deals including estate development and related disposals. He is part of the Academy Team and has advised numerous schools on property matters pre and post conversion. Robbie also advises several of the firm’s FE and HE colleges on various property matters. Robbie leads the firm’s dedicated leisure and tourism practice. His role involves advising a range of leisure and tourism clients including hotels, B&Bs, restaurants, licence traders, visitor attractions, leisure operators and tourism membership groups. He joined the board of Keswick Tourism Association as a Director in December 2013. Robbie works closely with the firm’s Head of Planning assisting clients with planning of applications, advising on section 106 agreements, enforcement proceedings, advising and representing on planning appeal and planning inquiry. He has worked on secondment in Carlisle City Council’s planning department and spends time each month with a leading planning consultant. Outside of work Robbie is an accomplished sportsman, playing football semi-professionally for Carlisle City Football Club. He also enjoys rugby, cricket, walking in the lakes and has a season ticket for Bury F.C.